On October 3rd, 1849, one of the great literary figures of the 19th century was found in a state of delirium on the streets of Baltimore. Four days later, Edgar Allan Poe passed away, not only leaving behind speculation and conspiracy surrounding his death but a legacy that defined both modern horror, science fiction and the birth of the Detective novel. To say that Poe was an influential writer would be an understatement. References to his fiction, whether subliminal or not – have embedded themselves in most of the art forms that embraced such revolutionary times. Poe died at the height of the Industrial Revolution – heralding dramatic change in political, economical and social status where commentaries were circulated at an alarming rate through the rapid growth of newspapers and periodicals. These writers who followed Poe; such as Jules Verne and H.G. Wells with their proto sci-fi tales; Arthur Conan Doyle’s famous Detective, Sherlock Holmes and H.P. Lovecraft’s distinctive horror were all a direct product of their time. It was during the late 19th and early 20th century that these writers’ own contributions to literature became hugely influential in their own right. Poe’s influence was imbedded in modern literature. His stories had begun to forge part of the modern American myth, yet it would need less personal accounts to take his themes of loss and despair to a whole new level. It would take not just the death of a writer to spark this change and give birth to modern heroes, but the collapse and depression of a nation. Where Superman was heralded as the beacon of light during the Great Depression – one that would give hope and strength – Bob Kane’s Batman was the antithesis that lurked in the shadows. One was a God raised by humble farmers whereas the other was born in to wealth and luxury only to witness his parents’ murder. The result is a man of deep torment who channels his loss to hone newfound skills to fight organized crime. Although there are traces of Poe through the character’s brooding, gothic nature, Bruce Wayne does not wallow away in self-pity as witnessed in Poe’s stories. Instead he channels his negativity in to a zen-like instrument of self-control that is unleashed and executed with necessary force. His choice of symbol is one to strike fear in to the heart of organized crime and the mask he wears allows him to hide behind that symbol. All the while the boundaries between the symbol and how much of the mask is truly Bruce Wayne, are blurred. 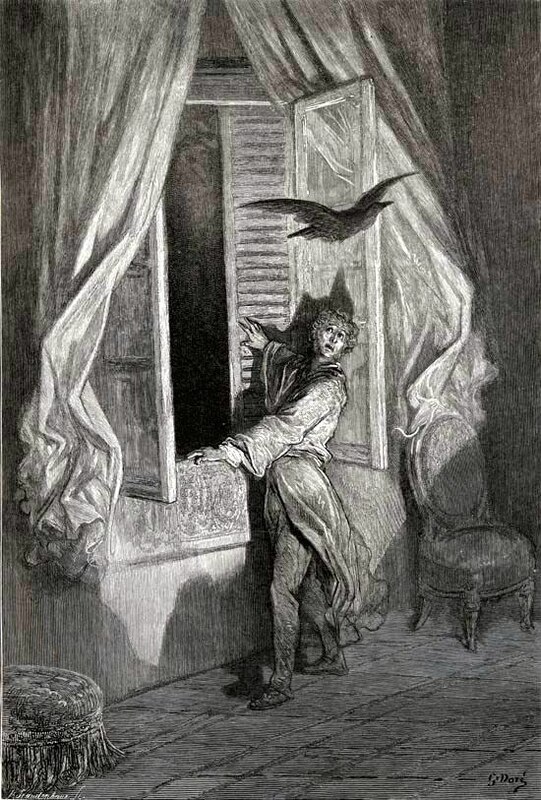 To view more parallels to Edgar Allan Poe, let us look at the iconic scenes of a man in mourning, the most famous of which, The Raven presents the writer alone in his study, where the infamous bird reminds him of the loss of his dear Lenore. Bruce Wayne, contemplating his future alone, witnesses a Bat, not so much a tapping or gentle rapping; but more of a dramatic crash through his window. The incident inspires a potent symbol of fear, a scene so similar to the works of Poe it seems somewhat awkward in its intent. But the story of Batman is one that has been reinterpreted through zeitgeist by many talented writers and artists, which is where such a character becomes an interesting analysis. This dissection of the character is a dissection of both a state of mind and the society it inhabits. Understanding this unlocks the layers and delivers the classic tales that are important and influential; whether it is the sadistic nature of Alan Moore’s The Killing Joke; Frank Miller’s origin of Year One and bookend, The Dark Knight Returns; Tim Burton’s gothic pantomime, Batman; Warner Brothers’ definitive Batman the Animated Series or Christopher Nolan’s The Dark Knight Trilogy; each tale has it’s own, distinctive style and message. What sets Nolan’s Dark Knight Trilogy apart from previous incarnations is the sheer scope and believability of the world – an earnest rendition that could be criticised for taking itself too seriously. Here we have a series of films that have embraced the mythology. Not only is Nolan conscious of the characters’ roots but also the commentary they have on today’s society. In Nolan’s universe, Bruce Wayne has never been closer to Poe as he mourns the loss of his loved one and hides away in his mansion burying himself in further remorse. In the final entry, The Dark Knight Rises, our hero is broken in mind, body and soul and is unlikely to ever recover until he is thrust back in to the pain and turmoil of his city. It is here that he must, once again, confront his enemies who are only a reminder of what he could become if he crosses the line. Is it a coincidence that the Dark Knight returns during a time of turbulent, economic crisis throughout the world? There are many who would say otherwise. However, for an icon to become such a potent symbol it must survive particular social commentary, political views, ideals, age groups and universal language. All of these areas carry an interpretation and help build the mythology and the legend of any story worthy of standing the test of time. Aside from the fact that Batman’s sidekick, Robin the ‘Boy Wonder’ was based on Hollywood’s version of the mythic hero – a number of characteristics of the common outlaw, Robin Hood can also be shared with Batman’s own motivations. Although he has great wealth he uses this in a similar act to aid the less privileged of society. Although the majority of blueprints for Batman can be linked to American culture and help to define a more archetypal American hero, it is within other historical references where some of the more interesting facts about the character and the world he inhabits are seeded. Noir undertones, gothic stature and iconography are the bones of what has made Batman so enduring and it is while exploring a more archaeological approach that we begin to understand where the many other aspects of the world he inhabits have been formed. Before Co-Creator, Bob Kane’s more obvious references to DaVinci’s flying machines and the pop/pulp culture of his time, one of the more interesting links to the mythology of Batman can be located in the legendary city of Nottingham, England. 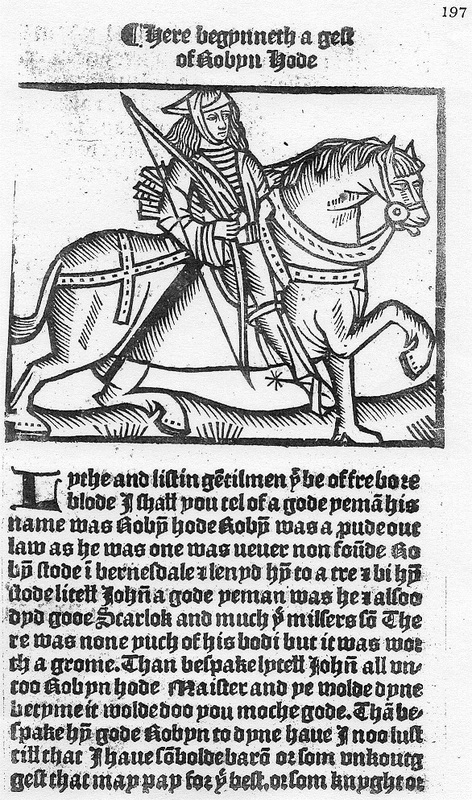 Not only can references be made to its Anglo-Saxon namesake, the ‘Place of Caves’ but more directly with the original Gotham at a time when knights and the most infamous outlaw of them all robbed from the rich and gave to the poor. It was during these times in the late 12th and early 13th century that King John requested a Royal Highway to be built through the village. To avoid the build and maintenance of the route, locals feigned madness – an act that, during these times, was believed to be highly contagious. Therefore, when King John’s knights witnessed the villagers’ insanity they withdrew; resulting in the King’s road rerouted to avoid Gotham. According to the story, Cityscape in Batman Chronicles #6, Gotham City is revealed as having initially been built to house the criminally insane – a journal, written by a villain plotting murder explains, “I even have a name for it. We could call it ‘Gotham’ after a village in England – where, according to common belief, all are bereft of their wits.”In direct reference to the legend, it is of no coincidence that Batman’s arch nemesis, the Joker, represents this feigned madness of Gotham – an enemy who, in a modern world, develops more anarchic personality disorders. This is made all the more disturbing through the use of his jester / clown-like appearance where, traditionally, a medieval fool would be summoned to entertain the ruler of his kingdom to help di ‘jest’ his food. The comedian – iconic of fun and laughter is now transformed in to the nightmarish grim reaper dealing the chaotic hand of death and destruction, which is all the more difficult to swallow. It wasn’t until 1807 that the American author, Washington Irving became aware of the original tales and began to frequently refer to Manhattan as Gotham in his own writing. Irving’s satirical periodical, documented as the Salmagundi papers, were the first to refer to the legendary English village and, in time, eventually evolved in to a popular nickname for New York displayed on shop signs and important institutions such as the Gotham Center for New York City History. 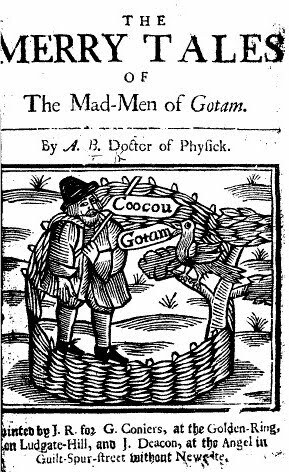 Gotham had been known as a common synonym for New York since medieval times where the original villagers claimed to be mad. Similar ‘fools’ were later recalled in the nursery rhyme, The Wise Men of Gotham as they sailed from their mother country to make their fortune in New York as residents of a ‘New Gotham’. American Historians, Edwin G. Burrows and Mike Wallace also explained how the name was adopted by New Yorkers in their book Gotham: A History of New York City to 1898, stating: ‘Manhattanites would not likely have taken up a nickname so laden with pejorative connotations – even one bestowed by New York’s most famous writer – unless it had redeeming qualities, and indeed some of the tales cast Gothamites in a flattering light.’ It could be said that the famed stories recounted by the villagers, who later influenced further tales of the ‘Wise Men of Gotham’, went on to represent a group of people who were not quite so mad after all and that their allusion to the apparent affliction was no more than an elaborate ruse that symbolised a hidden cunning to outwit their ruler and prevent their village from being destroyed by a Royal Highway. In subsequent tales this concept is built further on these foundations of fools and mad men surrounding the origins of the fictitious psychiatric hospital, Arkham Asylum. A direct nod towards the works of the influential American horror writer, H.P. Lovecraft, the hospital is named after the Sanatorium in the fictional city of Arkham, Massachusetts that frequents a number of the author’s short stories. Having developed its own long and brutal history of insanity, suicide and murder; most of which is directly linked to those who helped build the asylum and treat their patients. Arkham Asylum has gone on to house all of Batman’s Rogues Gallery at some point, only for them to escape or once again let lose on Gotham City all the more broken and insane. Originally an unnamed ‘teeming metropolis’ in Detective Comics #29, by issue 31 Batman’s city was explicitly identified as ‘New York’ before Co-Creator, Bill Finger changed the name after finding the name ‘Gotham Jewellers’ in a phonebook. The resonance of the name stuck and ever since those early issues, the character of Gotham City has continued to inspire readers and forge the perfect environment for a Detective to thrive as he forever delves in to the disturbing undercurrents of crime. Ever since, the architecture of this fictitious world has managed to grow from historical references and popular culture, as many artists and writers have continued to build on Batman’s original concept of a primordial being that manages to become one with his environment. 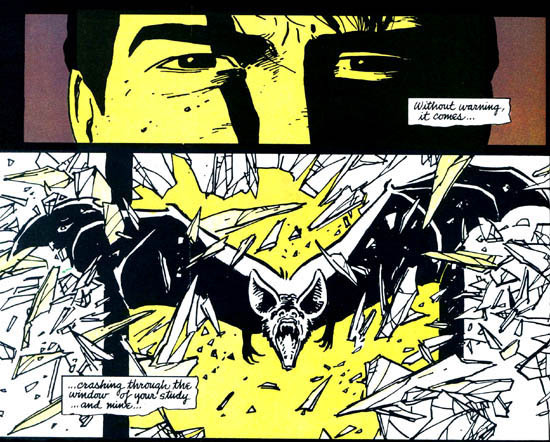 Without such a strong sense of identity and connection to his city, Batman would become redundant in his actions and insignificant in his message. It is the inheritance of any identity that can always be seen within the traces of ancestry. Batman is a legend in his own right and one of which has been shaped by many other stories and designs that have come before. Where the medieval period delivers familiar, parallels that help convey a sense of myth, it is within the Gothic movement that we begin to witness the world of more complex characters and worlds truly take shape. Therefore it is unavoidable to delve in to the foundations of the fictitious universe of Batman without exploring the more potent and obvious influence that succeeded the medieval period. Before these darker times drew to a close with the death of Richard III at the Battle of Bosworth and the end of The War of the Roses, a more romanticist style of architecture had begun to flourish throughout Europe. The term ‘Gothic’ did not appear until the late Renaissance with its origins in a specific period known as Opus Francigenum which translates to ‘French Work’. Characteristics include the pointed arches that now rest uneasy among modern architecture; the ribbed vault, flying buttress and looming Gargoyles that have provided familiar company for the Dark Knight as he surveys his city. Most familiar as the fabrication and structure of the great cathedrals, abbeys and churches it can also be seen in castles, town halls, guild halls and universities; the latter of which tend to be more associated with the Gothic revival in mid-18th century to late 19th century England. It was this revival that inspired the great literary works of the time. 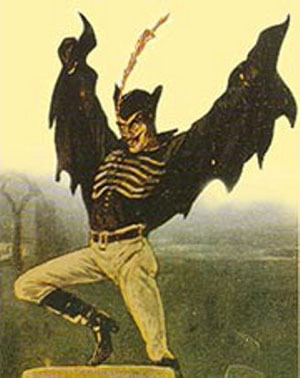 Familiar silhouette and iconography in the demonic appearance of English, urban legend, Spring Heeled Jack.Tales of vampires, ghosts, maniacs and dopplegangers ran rampant through the underground passages left over from darker times, playing on the imagination and challenging the reader on what possible truths such fiction could offer. During the Victorian era, English folklore told tales of ghosts roaming the streets of London and inspired the apparent sightings of the entity known as Spring Heeled Jack who was first documented in 1837. The urban legend soon spread all over England and due to his strange appearance and his ability to leap across rooftops, he became the subject of several works of fiction. Illustrations resembled a proto-Batman of diabolical, physical presence that revealed wings, clawed hands and fiery eyes. Further reports referred to helmets and garments that resembled oilskin while others described the tall, slender figure of a gentleman – a variation that perhaps alluded to a potential duel identity. Before exploring the psychology of Batman in more detail in Part IV, it is important that this area is touched upon from earlier, significant influences. It is in these Gothic works that the existence of the supernatural often confirms the ‘haunting by a second self’ – the anxiety of a double persona later argued by Neurologist, Sigmund Freud to be a repression caused by the irruption of disquiet when separated from our mother’s womb. Yet, despite some of these links to the divided personalities of Mary Shelley’s Frankenstein and his creature along with Oscar Wilde’s Dorian Gray, to name a few, there is a also a significant link to the ‘sense of loss’ in major works of Gothic literature – none so more apparent once it had reached the shores of America through the works of Edgar Allan Poe. One of a number illustrations by Gustave Dore’s based on Edgar Allan Poe’s The Raven. More than reminiscent of a brooding Bruce Wayne as he awaits the call of the Bat. Poe’s poem depicts a slow descent into madness as the main character laments the loss of his beloved. Poe’s own mysterious death had not only left behind speculation and conspiracy surrounding his own demise but a legacy that defined both modern horror, science fiction and the birth of the Detective novel. References to his fiction, whether subliminal or not – have embedded themselves in most of the art forms that embraced such revolutionary times. Poe died at the height of the Industrial Revolution – heralding dramatic change in political, economical and social status where commentaries were circulated at an alarming rate through the rapid growth of newspapers and periodicals. The writers who followed Poe; such as Jules Verne and H.G. Wells with their proto sci-fi tales; Arthur Conan Doyle’s famous Detective, Sherlock Holmes and H.P. Lovecraft’s distinctive horror were all a direct product of their time and it wasn’t until during the late 19th and early 20th century that these writers’ own contributions to literature became hugely influential in their own right. Although there are traces of Poe through the character’s brooding, gothic nature, Bruce Wayne does not wallow away in self-pity as witnessed in Poe’s stories. Instead, as a more modern hero, he channels his negativity in to a zen-like instrument of self-control that is unleashed and executed with necessary force. His choice of symbol is one to strike fear in to the heart of organised crime and the mask he wears allows him to hide behind its potency. All the while the boundaries between the symbol and how much of the mask is truly Bruce Wayne, are blurred in direct reference to Gothic undertones of repression and a second self that delivers a more fearful, demonic image. Poe’s influence in particular was imbedded in modern literature and his stories had begun to forge part of the modern American myth, yet it would need less personal accounts to take his themes of loss and despair to a whole new level. It would take not just the death of a writer to spark this change and give birth to modern heroes, but the collapse and depression of an entire nation. 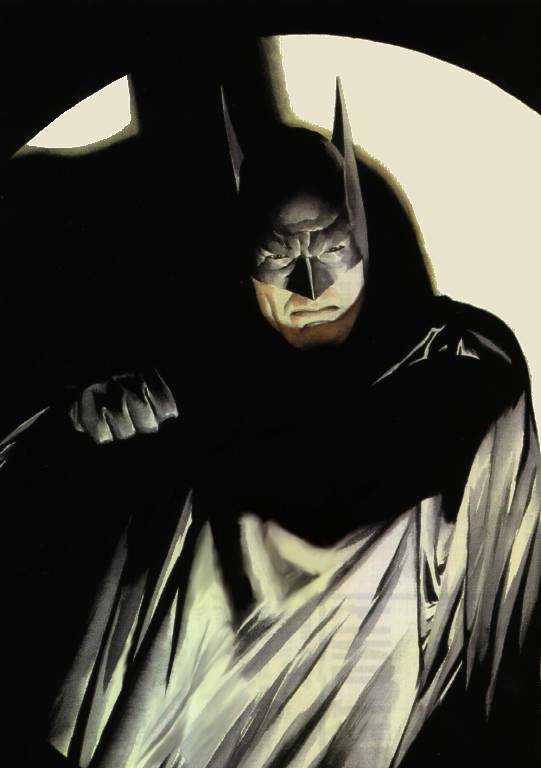 Alex Ross’ Batman is often depicted as lo-tech – highlighting the character’s mystery. In Ross’ universe he still has the rope, the unmarked car and crude weapons. ‘He just appears, which is even scarier.’ Alex Ross, Mythology. ‘Criminals are a superstitious, cowardly lot, so my disguise must be able to strike terror into their hearts. I must be a creature of the night, black, terrible…a…a bat! That’s it! It’s an omen. I shall become a bat!’ Detective Comics #33, November 1939. During a time when there were less distractions in the world, those children who first witnessed the birth of the superhero during the harsh climate of Depression era America gave very little thought in parting with their own pocket money. Detective Comics #27 illustrated a new character in contrast to the bright colours and optimism of Superman and instead delivered a dark, demonic figure cloaked in cape and cowl more reminiscent of gothic horror than innocent adventure. The Batman was composed with cinematic verve, a criminal clutched under his arm as he flies on bat-like wings high above the city with perfect grace and strength. As those kids clutched that comic book in their hands for the first time and studied the cover more closely, they realised that he wasn’t flying at all, yet merely swooping on a rope as would any mortal man attempt to traverse the rooftops. Here was a primal, mysterious new character hinted at through his own concealed eyes – nothing more than knife cuts that helped convey an air of menace and, perhaps, secrets that any good Detective story thrived on. It is questionable in today’s society if criminals are ‘superstitious’ and that modern audiences would accept a hero whose reason behind dressing up as a bat was forged by an omen. There is, however, the gothic undertone that harkens back to classic American literature, such as Edgar Allan Poe’s The Raven and therefore the details surrounding his origin bore strong, cultural significance. In subsequent stories, certain details have been altered due to changes in society and audience perception. But what hasn’t changed since Batman’s origin unveiled in both Detective Comics #33 and Batman #1; is his humanity. Omens have been replaced with a more psychological approach that has helped to develop more intention and reasoning behind the actions of one man who wears the mantle of a bat to avenge the murder of his socialite parents. 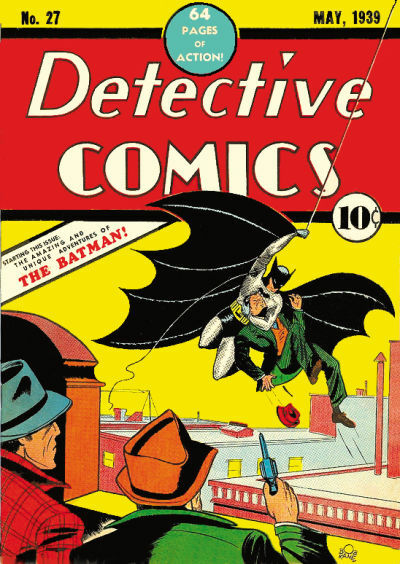 Batman’s first appearance in Detective Comics #27 is the second highest valued comic and has sold for over 1 million dollars. The Bat-Man of Gotham, Caped Crusader, Dark Knight, The World’s Greatest Detective – Bob Kane and Bill Finger’s iconic creation of American pop culture has embedded himself in the hearts and minds of generations of children and adults alike for the past 75 years. Much more than a product of his time, the cultural phenomenon of Batman has been shaped by a rich tapestry of historical and contemporary references – a character that has grown throughout the stories and world he inhabits; transcending his medium and gaining the ultimate accolade of global success and universal appeal. First and foremost it is the journey of alter ego, Bruce Wayne that has helped display the importance of his humanity and a key aspect that distinguishes him from other popular characters within his genre. Where the patriotic Superman lends himself more to classic myth and religious archetypes – a godlike figure that some demographics struggle relating to – Batman represents a more introverted and psychological aspect of the superhero that helps define his nature and make him more accessible. While Clark Kent had no recollection or memory of his parents’ death and was nurtured by his humble, adoptive family, Bruce Wayne witnessed, first hand, the violent death of his wealthy parents and was left in the soul care of his Butler. This defining moment could be seen as the night Bruce Wayne also died, leaving a deeply disturbed individual who has sort solace in avenging his Mother and Father’s death. It is this demon of vengeance that contributes to his own psychopathic tendencies; a vigilante born out of a traumatic experience that has set him on a path of self-discovery and discipline. Despite his brooding and deeply troubled backstory, it is these very details that have contributed to the myth and legacy of Batman. At the heart of the character he is simply a man and the fact that he relies only on his wit and gadgets is his everlasting appeal – many wish they were Batman while others simply are. His humanity can also be defined by how he has dealt with and continues to deal with his own psychosis. Despite being labelled an outlaw in true American mythological fashion, he attempts to justify his actions by saving the lives of others and following a strict code – that he will never, under any circumstances, kill. But, when one picks up the mask, others follow. Whether it is his allies or Rogues Gallery of villains, Batman sets precedence in his actions and, in some way, is responsible for their creation – the high price a man pays for the personification of vengeance. It is in this study of Batman that the roots of the character will be explored in order to understand what has made him such an enduring figure – how the icon of the bat has evolved in to an identifiable message that goes beyond the potent imagery of fear and, instead, represents the hero and justice in an otherwise imperfect society.